We have a small family farm in the interior of BC that is home to some exceptional Cardigans! 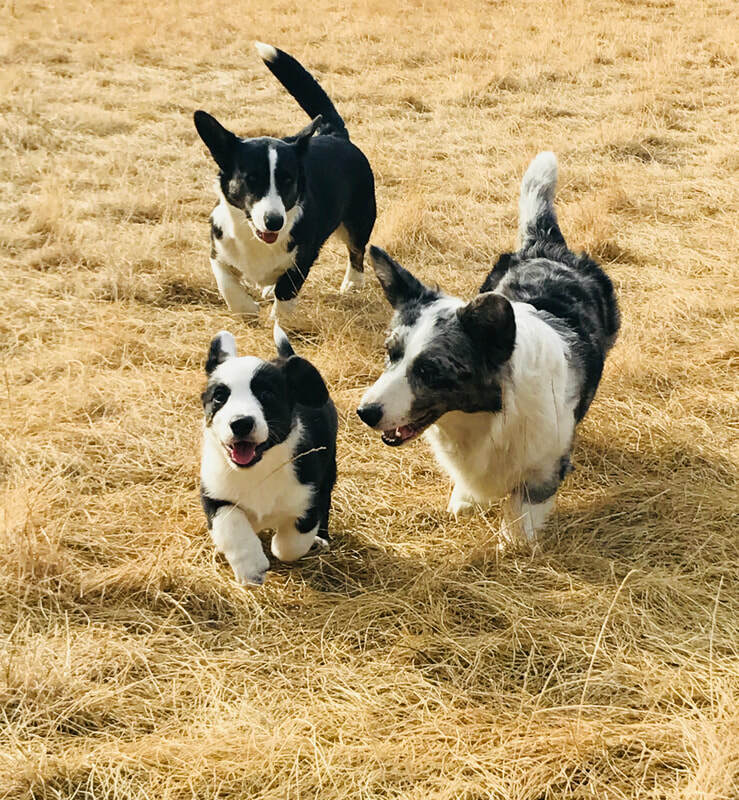 We strive to ensure the continuation, preservation and promotion of this beloved breed of Corgi through raising and breeding dogs that prove to be successful in conformation, as working dogs, and have best friend temperament. Cardigans are highly trainable due to their intelligence and desire to please. That said, Cardigan's have their own mind and may decide to train you instead, but with consistent and clear training signals you will be sure to win over your Cardigan and have them behaving, following the house rules, and even impressing you with their newly learned tricks. Cardigans are a big present in a small package, each having an unique personality that you will come to cherish. As a common trait, they say all dogs are loyal, but none so much as Cardigan Corgis, known for their fierce loyalty. And they are not ashamed to show it. Though it might be interrupting their mid-day nap, most Cardigans will pick themselves up to follow you room to room, just keeping an eye on the object of their affection - you! One of the best things about this breed is their versatility. Because they are medium in both size and activity level. They can find a quality home at either a farm or an apartment. You can train your Cardigan to round up the cattle, protect your home or even stand up to the most ferocious of animals (such as a bear, but I don't recommend this!) they will do it without a second thought; but also, Cardigans don't require such excitement. They are just as happy spending the day lounging around on the rug, having a couple of cuddle sessions with you and hopefully a loop around the block, being their only needs for excitement on any given day. FUN FACT: Corgi's love to lay with their feet straight back! All my Cardigans are first my pets, and second my show dogs. This is before they are ever considered for breeding. We love training, traveling, and doing fun activities with our dogs. If you are interested in having a Cardigan join your family please let me know by filling out the contact information below. All my pet families enter into a contract that protects everyone's interest, especially the dogs. The second step is you read over my contact and let me know if it's to your approval. When puppies are three days old I will be taking deposits from their new owners. 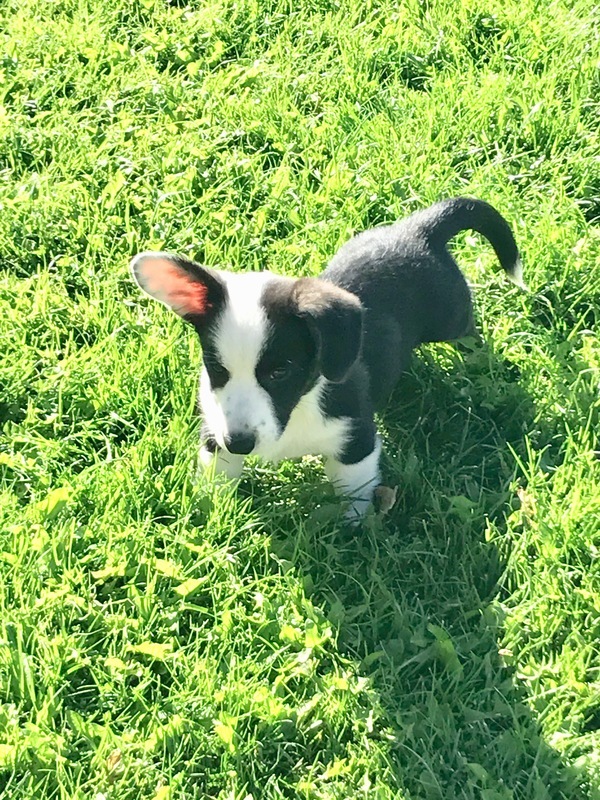 When puppies are 8 weeks old I will take them in for their first set of shots, get them dewormed and microchipped, and shortly thereafter they will be picked up or shipped out to you! I am sorry to inform you that my wait list is quite long now and for the time being I will not be accepting any more applications. I will remove this statement when I can accommodate families in the foreseeable future. Thank you for your understanding. Example: Are planning on taking a puppy obedience class to help train your puppy? Will your dog be left unattended, if so, for how long?